"Creeping Jenny" redirects here. Convolvulus arvensis is also sometimes known by that name. Lysimachia nummularia (syn. 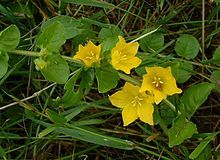 Lysimachia zawadzkii Wiesner) is a species of flowering plant in the family Primulaceae. Its common names include creeping jenny, moneywort, herb twopence and twopenny grass. It is native to Europe, but has been introduced to North America, where it is considered an invasive species in some areas. It aggressively spreads in favorable conditions, such as low wet ground or near ponds, but is usually easily removed by hand pulling. The Latin nummularia means "like a coin", referring to the shape and colour of the flowers; hence the common names, such as "moneywort", which also references coins. It is a vigorous, prostrate, evergreen perennial growing to 5 cm (2 in) in height and spreading rapidly and indefinitely by stem-rooting. It has rounded leaves, and cup-shaped yellow flowers 2 cm in diameter, in summer. It is particularly associated with damp or even wet areas, though in cultivation it will tolerate drier conditions. It is cold hardy, surviving lows of −40 °F (−40 °C). It is available for planting in temperate regions as a horticultural item, and is usually offered as an accent plant, but must be used with care because it can spread rapidly and crowd out other plants. It makes a nice groundcover where the range of its growth can be limited. It is also suitable for a bog garden or as an aquatic marginal plant. 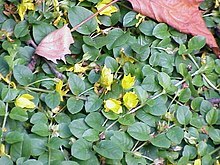 The cultivar 'Aurea' (golden creeping Jenny) has yellow leaves, and is somewhat less aggressive than the species. It has gained the Royal Horticultural Society's Award of Garden Merit. Moneywort is used in herbalism for healing wounds. The plant contains a number of phenolic acids. In traditional Chinese Medicine, Lysimachia (whole plant) is used to treat stone lin syndrome, which encompasses gall stones and urinary bladder stones. Some practitioners are using this herb to battle painful gout symptoms. ^ a b RHS A-Z encyclopedia of garden plants. United Kingdom: Dorling Kindersley. 2008. p. 1136. ISBN 1405332964. ^ "RHS Plant Selector - Lysimachia nummularia 'Aurea'". Retrieved 22 May 2013. ^ Luczak, S; Swiatek, L; Daniewski, M (1989). "Phenolic acids in herbs Lysimachia nummularia L. And L. Vulgaris L". Acta poloniae pharmaceutica. 46 (4): 381–5. PMID 2635807. Wikimedia Commons has media related to Lysimachia nummularia. This Ericales article is a stub. You can help Wikipedia by expanding it. This page was last edited on 23 March 2019, at 19:17 (UTC).